The cinema is not a vital element in the leisure-time of Lyme Regis people. In this little sea-town, described by Macaulay as a “small knot of steep and narrow alleys, lying on a coast, wild, rocky and beaten by stormy seas,” neither young nor old are movie mad; the cinema seem comparatively unimportant. Lyme was once an important town in the West, a wool and weaving centre and a seaport doing a considerable trade in wines and tobacco. Its industry and commerce made it a stronghold of puritanism. In the Civil War it stood out for Parliament when all the West, save Poole, was held by the Royalists, resisting siege by Prince Maurice of the Rhine for two months. It stood strongly for Protestantism against the “Papists,” for Parliament against Absolutism. The strength of its opinions were again shown when Monmouth made his bid for the throne of England in the name of the Protestant religion. He landed at Lyme and a large part of the town’s male working population marched out with him. They were marched aimlessly around Somerset until, armed only with scythes and staves and rough swords, they were slaughtered at Sedgemoor or taken to grace the gibbets of the Bloody Assize. This was the last event of national importance in the history of Lyme. From then on its chronicles tell of decline in its industries. But the people held stubbornly to their opinions and, in a smaller way, went on fighting for them. Out of centuries of such struggle its people achieved a character and strength of their own. It is written all over the counties of Dorset and Devon, this struggle and its later phase, the struggle against squire and parson is mutely testified by the scores of chapels, around the right to build and to worship in which many a bitter fight waged. And, in the nineteenth century, Dorset gave to trade unionism its most celebrated martyrs. To-day Lyme is a seaside resort, small, and, as such places go, unimportant. Its past gives it and its people a character not to be found at the popular seaside resort: the film of the Monmouth Rebellion, once proposed but banned by authority, could be made in its streets, acted and spoken by its people; and with scarcely a change in clothing would be more eloquent of the subject and the times than most of the expensive costume dramas of the studio. A great deal of the character remains; but its industries have gone. There is now but one important industry: the direct or indirect catering for visitors and summer residents. The town reflects this change in its livelihood-making but slowly; it begins to cater slightly for the visitor. A pin-table amusement saloon has made a nervous appearance on the sea-front, but is regarded with heavy disapproval by the authorities, who, by banning the giving of prizes, have recently struck at the basis of its business. The one cinema in the town is soon to have a “luxury” companion. Lyme’s one cinema is perched high on the sea wall, and in the winter rough seas swamp over the entrance giving many a patron a soaking. Films have been shown in this building for eight years; before then they were shown in the eighteenth century assembly rooms, now demolished. The present home of the movies was once the Volunteers’ Drill Hall, a name which takes it well back into the nineteenth century. Then it served as a theatre. Underneath the cinema, in the high sea wall, are deep vaults, once Roman baths. A visit to this cinema is a strange experience to anyone used to London “supers” and their audiences. It seats about three hundred. Its smallness, its setting — the queer old town, the rugged cliffs, and the sea breaking on the rocky shore beneath — make it seem most unreal. The audience too seemed apathetic to the films and certainly not willing to applaud or to praise. It being summer according to the calender [sic], the audience was mixed: the sixpennies — right bang in the front and almost close enough to the screen to take part in the films — and the ninepennies, only a few rows behind, were occupied by local people, mainly young, though here and there a labouring man and his wife, dressed for the visit and clearly uncomfortably conscious of being at the cinema. In the one-and-threes and the balcony were visitors. The mixed nature of the audience made clear-cut impressions difficult. All these facts, the setting, the smallness of the cinema, the audience, made a hard test for the films. Many of them seemed fantastic in these surroundings. The first, for example, was the magazine-interest film. We were shown how champagne was made, from the field to the table; the latest fashions in women’s clothes, some of the garments costing more apiece than many of these people earned in a twelvemonth; finally two young Americans climbing Monte Blanc, in great danger according to the commentator though this was by no means obvious. As the people of Lyme Regis live all their lives at an angle of forty-five degrees, or so it looks to a stranger, this climbing up and down must have seemed very commonplace. A Secrets of Nature film was next; it seemed to interest the swells greatly, but the front seats hardly at all. It was about seagulls, again hardly a novelty to the locals. Then the newsreel. This is bad enough when one sees it in London, sandwiched in a long programme, but here its triviality seemed outrageous. It was all Royalty and parades with one of the usual obscure and meaningless motorbike-races-round-the-houses thrown in. It brought nothing of the events pounding the world to pieces, nothing of the happenings and men of our day. Its dullness and uselessness was never so striking as in this place where real, vital news of the outside world could mean so much. The main feature film in the first half of the week was Men of Yesterday. This film was not well liked on its London showing, being condemned for its sentimentality. It was a film about the efforts of ex-servicemen to promote peace by giving a dinner to ex-servicemen from allied and ex-enemy countries. It had all the faults of this conception and all the features of the ex-servicemen’s appeal and movements. It was overwhelmingly sentimental and, set against the stream of world events, its solution of the war problem seemed astonishingly trivial and foolish. Yet it made some impression. It had an uncomfortable sincerity; the people were more real than is usual in British films. It was about ex-servicemen and they were very much like ex-servicemen. There were no stars, apart from the almost forgotten Stewart Rome and a short appearance by George Robey. It was obviously liked, though this liking was tempered by the objection to war films which, it seems, is as strong here as elsewhere. I give these impressions for what they are worth because it is almost impossible to find out what people here like or dislike in films. The box-office does not show it, save in rare cases; the people express few opinions, occasionally one or two will say the film was bad. 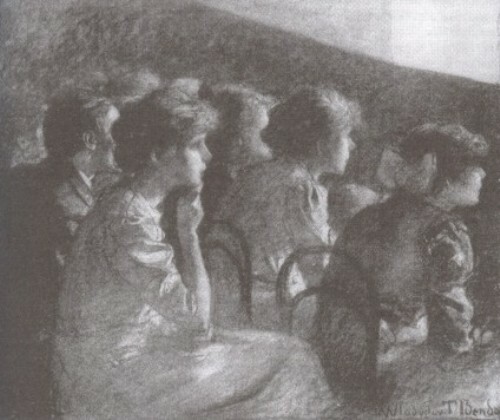 The first show decides the attendance on the next two evenings; opinions are reported among friends, work-mates and neighbours. The fantastic and far-fetched are not popular. Neither is the educational. Musical films are; Rose Marie was one of this year’s successes. The other was Mutiny on the Bounty, which did great business. Other films which have done fairly well this year have been: Mr. Deeds Goes to Town, Strangers on Honeymoon, Little Lord Fauntleroy, The Three Maxims, When East Meets West. In so far as attendance provides any sort of guide here, George Arliss has some following, as have the Lynn-Walls team. War films are as unpopular here as elsewhere; educationals are disliked; “near the knuckle” films frowned upon; Westerns and action pictures fairly popular with the men; musicals with the women. In the summer the cinema gets a great deal of its support from visitors; in the winter it depends on the local people. It is the only form of amusement for winter evenings in this town, but during the winter there is a great deal of unemployment. The money earned in the short summer season has to be eked out over the long winter and visits to the cinema are therefore few and far between for most. Through the winter the cinema does a fair business, but very rarely indeed does it have to turn people away, small though the seating capacity be. It must be remembered too that the intense interest in pictures, fed by the “fan” magazines, by the press reviews and stories, has little effect here — the number of films that can be seen is limited. With one cinema there is no choice. Film papers are something which the local people do without. The reviews of the films in the Press, even the “current release” reviews are useless to these people, for only a small — and not always the best — part of the releases ever reach them and then only long after the reviews have appeared. Allowing for all these factors; for the poor selection opportunity, for the smallness of the cinema, for the poverty of the people over the greater part of the year, the comparative unimportance of the movies here is not completely explained. The truth is that, though it has been in and around Lyme for many years, the cinema has not driven itself into the lives of these people as it has done in the towns. The only leisure-time entertainment for the young in the rough winters it is not a vital part of their lives. Perhaps it is as important to them as it was to most people twenty years ago; a way of passing an evening, a place to go to, a chance to see places, people and events occasionally. They live under conditions that have changed but little in external environment; they are tied to ways of life and of thought much more than are the young in the towns. It should be emphasised too that there is a community of life and of interest in places like Lyme which is not found in the towns. Chapel-going, the gossiping in the streets and in the neighbour’s house — in the quiet, warm summer evenings the streets are alive with groups of men and women gossiping — and a common dependance [sic] upon summer “lets.” Life in these places is harder, more in contact with natural dangers, more built around the seasons and the tides, more bound up with the past, its thinking and living, and less affected by the new and the novel, than in the urban district. In any case much of the youth is drawn away to brighter employment prospects in neighbouring towns; those left find their occupation around the parasitical job of providing for visitors. Yet these people have a character and strength that prevents them from ever becoming a race of boarding-house keepers. If they ever get the cinema-going habit, not any film will get by. Circumstances, environment, plus a deeply critical nature, a hatred of artifice and showyness — these factors will prevent the movie which is unreal and false being successful among these people. Comments: Richard Carr was a film journalist. 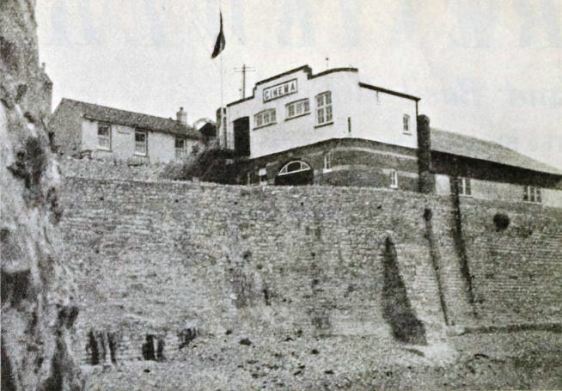 The Marine cinema at Lyme Regis was built as a drill hall in 1894, and started showing films in the 1920s. It continued showing films into the 1940s but a larger cinema, the Regent, was built in 1937 (it burnt down in 2016). The building continues as the Marine Theatre. The films shown during Carr’s visit were the British feature film Men of Yesterday (1936), directed by John Baxter; one of the 1922-1933 Secrets of Nature documentaries made by British Instructional Films; and a cinemagazine and a newsreel. This entry was posted in 1930s, Film journals, United Kingdom and tagged Audiences, Cinemagazines, Cinemas, Lyme Regis, Men of Yesterday (1936), Nature, Newsreels, Prices, Richard Carr, Screens, Seats, Secrets of Nature (1922). Bookmark the permalink.